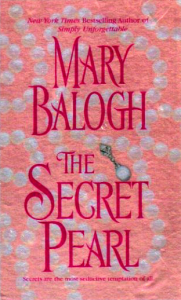 The Secret Pearl was first published in September, 1991. It is often named by long-time readers as one of their favorites among my books. It is an intense, passionate book with its deeply wounded hero and heroine, who have to find healing and wholeness through each other before they can commit themselves to loving each other for a lifetime. But healing does not come easily for either of them. Adam Kent, Duke of Ridgeway, is physically maimed, and he is tied to a life of barren duty from which there seems no way to extricate himself since he is an honorable man. His growing passion for Fleur Hamilton only adds one more apparently hopeless complication to his life. And Fleur is not all she seems. She hides an agonized past beneath the quiet exterior of governess to the duke’s young daughter. And how can she come to love the man she met amid such ugliness? How can she dare love him anyway when he already has a duchess? And what about the duchess? And the duke’s daughter? And his brother? Are they all they seem to be? The book is full of secrets, all of which have to come to light and be resolved before the story can reach its inevitable happy ending. This publication of The Secret Pearl by Dell has a new and rather lovely cover (in my opinion!). Apart from the new publisher and the new packaging, however, everything else remains the same, despite the temptation to get back into the book and make some changes fifteen years after I first wrote it. A few months ago I sounded out the several hundred members of my fanlist on the topic and they were adamantly and vocally unanimous in their opinion that readers do not like republications in which either the title or the text have been changed. And so here–with all its possible warts–is The Secret Pearl again. I hope you will enjoy it, whether you are a reader who is only now trying to collect my backlist or whether you are someone who has read the book before but cannot resist buying this new package and reading the story again. It was only her despair that drove Fleur back to the agency five days after she had become a whore. She felt no real hope as she opened the door and stepped inside. But she knew that that night she was going to have to return to the Drury Lane Theater or somewhere else where fashionable gentlemen congregated and would be in search of a night’s pleasure. Her money was gone. “Do you have any employment suitable for me, ma’am?” she asked Miss Fleming, her voice quiet, her eyes steady and calm–she had trained herself through a difficult childhood and girlhood never to show any of the pain or degradation she might be feeling. Fleur found herself clasping her hands painfully together, her nails digging into her palms. She felt breathless, as if she had run for a whole mile. A governess. Oh, no. She must not even begin to hope. The man would probably not consent even to see her. Fleur was very aware of her wrinkled silk dress and drab cloak and the absence of a bonnet. She was dressed in the clothes she had been wearing more than a month before when she had run away. She was aware of the plain style of her hair, of the shadows below her eyes, of her cracked lips. She swallowed and stepped through the door. Miss Fleming closed it quietly behind her, remaining on the other side of it. “Miss Fleur Hamilton?” The man who was seated behind a large table examined her slowly and keenly from head to foot. Fleur stood still and looked back. He was young, bald-headed, thin. If her appearance was unacceptable, then let him tell her so now before her hopes soared despite herself. He gestured to a chair, and she sat, her back straight, her chin high. She answered his questions as clearly and as honestly as she could, the blood hammering through her temples, her hands clasped into fists in her lap, the fingers of both hands crossed out of sight. Please God, she prayed silently. Oh, please, dear God. “If I were to communicate with your former school, the headmistress would confirm what you have told me?” he asked. “Yes, sir, she said. “I am sure of it.” But please don’t. They would not recognize the name. They would deny that I was ever there. 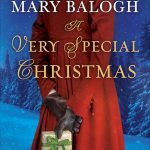 “Would you tell me something of your family and background, Miss Hamilton?” Mr. Houghton asked her at last. Forgive me, Papa, she begged her dead father silently. “A little over a month ago,” she said. “What employment have you had since?” he asked. She was silent for a while, staring at him. “I had enough money to last until now,” she said. 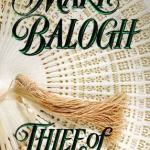 She sat still while his eyes moved over the unsuitable silk dress beneath her cloak. He knew. He must know. How could she have lived through all the pain and degradation of the past week and keep it all invisible to the eyes of strangers? He must know that she lied. He must know that she was a whore. She had known it was cruel, this hope. She had not really hoped at all. “I have none, sir,” she said. “I have never been employed. I have lived as a gentleman’s daughter.” And she waited quietly for dismissal. But hope had been cruelly kindled. Please, God, she prayed. Please, dear God. Oh, please. And she wished she had not come. She wished there had not been this illusory hope. “The post is yours if you wish for it,” he repeated. She stared at him. “Will Mr. Kent not wish to speak with me first?” she asked. “He trusts my judgment,” Mr. Houghton said. “I will need your full name and address,” he said, drawing paper toward him, picking up a quill pen, and dipping it in the inkwell, his manner brisk and businesslike. “I will deliver to you within the next few days a ticket for the stage into Dorsetshire and will arrange to have you met at the town of Wollaston and taken to Willoughby Hall, Mr. Kent’s home. In the meanwhile, I have been empowered to pay you some money in advance so that you may purchase clothes suitable for a governess.” His eyes lifted and ran over her again. She sat numbly listening to the impossible, the unbelievable. She was going to be a governess. She was to live in the country and have charge of the education of a five-year-old child. She was being handed enough money to buy herself some decent dresses and bonnets and shoes. She was to live with a respectable family in a respectable home. What would Mr. Houghton say, she wondered, how would he look at her, if he knew the truth about her? What would happen if he ever did find out? Or if Mr. And Mrs. Kent ever found out? How would they feel if they knew that their man of business was employing a whore to teach their child? She left the room and the agency in a daze, hardly noticing Miss Fleming, who nodded to her graciously as she passed. Inside the inner room, Peter Houghton pursed his lips and stared at the closed door through which his master’s ladybird had just passed. He could not see the attraction. The girl was thin and pale, with unremarkable features and reddish hair that lacked luster. When she had some weight on her, perhaps she would have a pretty-enough figure. But when all was said and done, she was but a whore whom his master had picked up outside the Drury Lane a few nights before. He had never known his employer to house a mistress even in London. And yet this girl was not to be set up discreetly in a town house of her own, where she could be visited and enjoyed at the duke’s leisure. She was to be sent to Willoughby, housed under the same roof as the duke’s wife and daughter. She was to be the daughter’s governess. His grace was a strange man. Peter Houghton respected his master and valued his employment, but still there was something strange about the man. The duchess was ten times lovelier than the ladybird. Wife and mistress under the same roof. Life should turn interesting. Presumably his grace would soon decide that a return to the country and domestic bliss would be in order. Peter Houghton smiled slightly and shook his head. One thing was certain, anyway. He would be delighted to be free of this room and Miss Fleming’s simpering and flirtatious smiles after four whole days of waiting for thin, red-haired Fleur to put in an appearance.